This disorder is typically called Non-24-hour sleep–wake syndrome (shortened to Non24), Free running disorder (FRD), or Hypernychthemeral disorder. If you just want to read about treatment options for sighted people with CRDs, jump to the last section of this post. 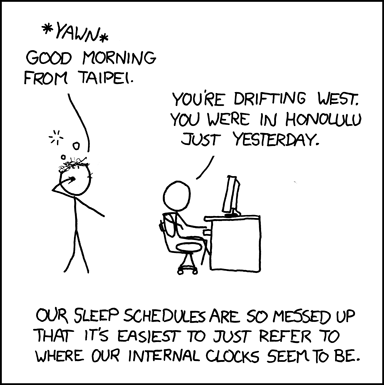 He lives in (let’s say) US Eastern time zone, but wakes up at what corresponds to 8am in the Honolulu time zone (1 pm EST) one day, and then goes on to wake up in what corresponds to the Tapei time zone (at 7 pm EST, 6 hours later!) the following day. The difference is that in N24, the jumps aren’t that large (XKCD would have a 30-hour circadian rhythm, but 25 to 27 hours are more typical in N24). So what does N24 look like? Here is a link to an actual sleep diary of someone with N24 – you can see how he goes to sleep and gets up later and later every day. The time of day is along the x-axis (horizontal) axis, spanning 48 hours (2 days). The date is along the y-axis (vertical). Each block represents the time Mr. LivingWithN24 is sleeping. If you want to chart your own sleep rhythm, take a look at these tools. I use Sleepbot and Sleep As Android. A related CRD is Delayed Sleep Phase Syndrome (DSPS) – now often called Delayed Sleep Phase Disorder (DSPD). With DSPS, you are able to stay on a 24-hour circadian rhythm, but cannot fall asleep until the early hours of the morning (e.g. anywhere from 2 to 6 a.m. or even later in some cases). If your Night Owl tendencies aren’t just a lifestyle choice, that is, you cannot fall asleep and get up earlier no matter how much you try – even when your education or job is on the line, you may have N24 or DSPS. Patients cannot change their circadian rhythms through sheer will power any more than someone with narcolepsy can make themselves stay awake or someone with epilepsy can make their seizures stop just because they want to. Circadian rhythm disorders are neurological disorders due to malfunctions in the suprachiasmatic nucleus in the brain – the body’s “master clock”, the recently discovered intrinsically photosensitive retinal ganglion cells (ipRGCs) in the eyes – which respond to light, and/or desynchronized interactions with the body’s other biological clocks. Here’s a much simpler explanation of ipRGCs (the third type of light sensitive cell in the eye!). Circadian Rhythm Sleep Disorders (CRSD) are a group of sleep disorders characterized by a malsynchronization between a person’s biological clock and the environmental 24-h schedule. These disorders can lead to harmful psychological and functional difficulties and are often misdiagnosed and incorrectly treated due to the fact that doctors are unaware of their existence. One of the most immediate negative consequences of N24 and DSPS, at least for those who are forced to live on a 24-hour, socially-accepted sleep/wake time schedule, is sleep deprivation. If you cannot get to sleep until 3 am but have to be at work at 7am, you’re going to build up some severe sleep debt. 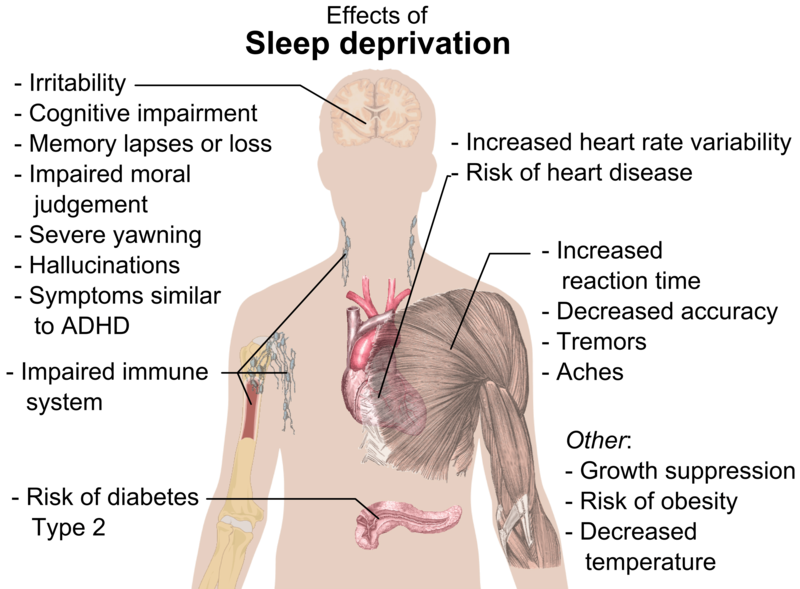 Chronic sleep deprivation is more than just an inconvenience, it has real physiological consequences. Treatment for a circadian rhythm disorder can involve correctly timed morning light therapy, evening light restriction, and melatonin. Some people have more success than others, and for some, treatment doesn’t work at all. A few words about treament. Typically, treatment for a CRD starts with light therapy, or morning bright light – also called phototherapy – and it involves sitting in front of a lightbox for 30 to 60 minutes as soon as you wake up. This stimulates the ipRGCs the same way sunlight would. It’s a good solution during the winter or for those living in countries closer to the poles. Quite a few people seem to have success using only light therapy. But in the same way morning light can reset your rhythm, evening light can trick your brain into thinking it’s morning, making it impossible to fall asleep at a “normal” time. Computer screens, ipads, and cell phones can also shift your cycle, even in people without a CRD! Because of this sensitivity to evening light, morning bright light therapy isn’t enough for some people. They’re not able to shift their schedule or stay on a 24 hour rhythm even when using bright light in the morning. So they try melatonin, but it can make them groggy or depressed the next day. This is where evening light restriction comes in. It’s also called dark therapy or scototherapy. Evening light restriction, or Scototherapy, can be used to counteract the effects of environmental light in the evening. It consists of wearing blue-blocking glasses in the evening hours before bed, effectively cancelling out the it’s morning signal coming from all the light sources in your environment. If blue-blocking glasses aren’t enough, you might try glasses that only let through 1 or 2% of the visible light. You can make your own by placing gel color filters in front of blue-blocking lenses (e.g. Roscolux #19 “flame”, #26 “light red”, or #27 “medium red”). You can also put color filters over light sources, e.g. 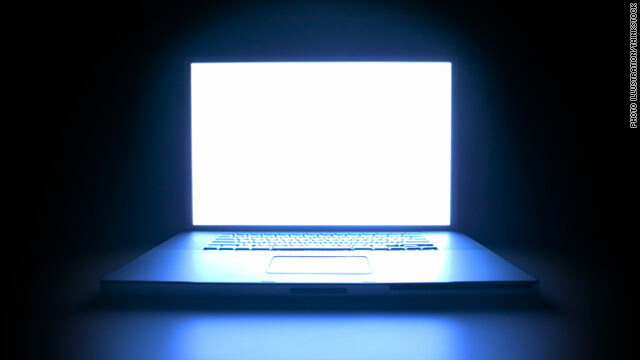 your computer, tablet, or phone screen or over lamps (NOT halogen lamps! – these gels are not fire resistant so use your common sense and do not place over lamps which generate a lot of heat). The following suggestions on implementing scototherapy have come about from discussions on the Niteowl list. I am only borrowing the knowledge that’s been shared there. I’d especially like to thank James Fadden and Sparrow Rose Jones for the knowledge and experience they’ve shared about N24, DSPS, and CRDs in general. The scientific basis for these suggestions is the circadian Phase Response Curve (PRC) – people react differenty to light and dark depending on the timing of their internal circadian rhythm. NOTE that we are not doctors or medical practitioners of any kind, so please contact your doctor before starting any treatment. You might start with putting your scototherapy glasses on 4 to 6 hours before your current bedtime. If your ideal bedtime is many hours before your current bedtime, you might try shifting in small increments. For example, you normally fall asleep at 4 am but really you want to fall asleep at 11 pm. Don’t start with putting your glasses on at 7 pm – your circadian rhythm can’t really make such large jumps. Instead, aim for falling asleep at 3 or 3:30 am, so put your glasses on at 11 pm. Work your way back earlier and earlier over the course of a few days or weeks, perhaps aiming for 15 or 30 minutes earlier every few days. The same approach can be used for light therapy: don’t just force yourself to wake up at 7am and start using light therapy if you normally wake up at 1pm. Start with waking up at 12:30 or 12:45pm, use light and scototherapy, and shift earlier by 15-30 minutes every few days. You may have to experiment to see what works best for you, and how fast you can shift your clock. If you have N24, the easiest would be to wait until you shift around to your ideal bedtime, and then use light and scototherapy to hold your schedule in place. You might want to start scototherapy a few days prior to reaching your ideal bedtime. Track your success using one of these sleep diary tools. It can be helpful to include additional information in the diary such as: duration and intensity of light therapy, duration and intensity of scototherapy, any medications or supplements and their dosages and timing, any other variables you think might be affecting your sleep, and your energy / alertness level on a scale of 1-10. This way, you can tie back any changes in therapy to how it affected you. If you or someone you know might have N24 or DSPS, head on over to the Circadian Sleep Disorders Network website, where you can find articles, scientific publications, and links on CRDs, treatment options, personal stories of others with CRDs, and a link to talk to others with the same problem. See also this excellent blog, delayed2sleep, as well as other posts from those participating in this year’s N24 Awareness Day. This entry was posted in Life and tagged Circadian, DSPS, Health, Non24, Sleep by abnormaldata. Bookmark the permalink.